Champ FMV nR Series Floodlight -The Champ FMV nR Series floodlight offers exceptional indoor and outdoor illumination in industrial areas. Because of its superior corrosion resistance and restricted breathing being standard, the FMV floodlight is the ideal choice for diverse industrial applications that include wet and marine environments. Champ F2MV Mini-Floodlight –The F2MV is a compact floodlight that consists of a Corro-Free™ epoxy coated copper-free aluminum enclosure with stainless steel external hardware and an impact-resistant glass lens. 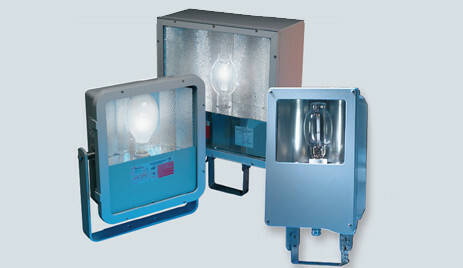 It is suitable for marine and wet locations and is ideal where space constraints restrict the use of larger floodlights. Champ FMV1000 nR High Wattage Floodlight- The Champ FMV1000 nR prides itself on offering restricted breathing and easy-to-wire terminal blocks as standard components. It is NEMA Type 4X and IP66 watertight and due to its heavy-duty vapor-tight, copper-free aluminum housing and stainless steel hardware, it is exclusively designed for harsh and industrial areas requiring broad area lighting. The Champ FMV1000 nR provides a robust design for optimal use in the most corrosive/marine environments. Champ Voyager nR™ Stainless Steel Floodlight- The Champ Voyager nR Floodlight offers the industry’s coolest temperature rating and is the only mogul-base Class I, Division 2 and Zone 2 stainless steel floodlight with restricted breathing as standard construction. It boasts a wide, powerful beam to deliver more light to your process, and with the standard terminal block and removable ballast-component tray, the Champ Voyager is perfect for outdoor, marine, corrosive, and high temperature locations. Download the Champ Floodlight Fixtures spec sheet below or call 714.835.6211 for more information.